Neighborhood Congregational Church Rev. B.J. Beu said he has resigned following a vote of the congregation asking him to leave. The Rev. 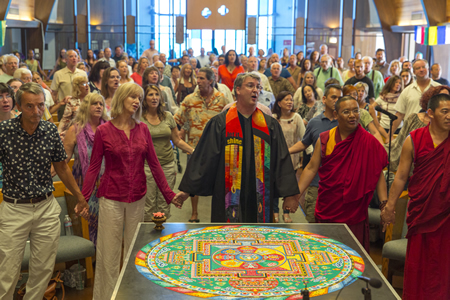 BJ Beu, center, takes part in a ceremony at the Neighborhood Congregational Church last October marking the completion of a sand mandala by visiting Tibetan monks.Photo by Tom Lamb. The church’s trustees and its members hold disparate views about the decision to part ways with its seven-year senior pastor. A vote was cast by 54 congregational members who showed up for the church’s annual meeting on Jan. 31, of which 36 members opted for Beu’s dismissal, according to an NCC church member who declined to be identified. Beu said he attended the meeting. “It’s a time of transitions at the church both locally and nationally, but comments on specific details remain premature,” Jeff Amos, head trustee for the church, wrote in an email. It’s not just about money, he said, but it’s related. Amos said Beu’s salary is within range for a California pastor in UCC, which recommends $60,000 to $65,000. Several attempts were made to reach other members of the church leadership through the church’s secretary. Only Amos responded after at least five requests. Beu will be taking “a few months sabbatical,” said Amos, who pointed out that church members have held several meetings over the last two years, trying to figure out ways to revive its congregation and working with its parent organization, UCC, to help determine its future. Beu will continue to serve as pastor through Easter, he said. “Sometimes it’s just time to move on.” Beu said he’s up for the change. “I am probably the least traditional pastor you’ll ever meet,” he said. Beu is acknowledged in the community for being instrumental in helping homeless people find food and shelter. Under his direction, NCC opened its doors as an overnight cold-weather shelter. “He and his congregation were some of the strongest advocates of the poor in Laguna,” said Elizabeth Rechter, former rector of Laguna’s St. Mary’s Episcopal Church. “He had the willingness to open up his church, open up that conversation with the community.” For the past seven years, church members have provided dinner once a week to people at the city’s homeless shelter on Laguna Canyon Road. Beu embraced initiatives that benefited impoverished people from elsewhere as well, welcoming mandala-creating Tibetan monks to Laguna who worshipped in a different way and supporting trips to refugee settlements in India. But like the rest of modern life, the Internet is challenging church traditions, offering a virtual plethora of spiritual websites that affect physical places of worship, said Beu. “People are getting their spirituality in different ways and a lot of them are getting it online in unique and different ways and the church is not exactly a fast institution to change,” he said. With more than 5,000 congregations across the nation, the United Church of Christ is seeing a 20-year decline in membership, dropping below 1 million people in 2012, and locking the doors of 696 congregations between 2000 and 2010, according to a report on its website. National UCC contributions also declined to $41 million in 2014, a $5 million drop over the previous 10 years, said Kristina Lizardy-Hajbi, UCC director of analytic research and data. On the other hand, less traditional churches, including Eastern religions and evangelical, are growing. Over the last decade, “biracial/multiracial and Asian/Pacific Islander congregations experienced the greatest growth (1.6%),” according to the UCC report. Taking religion in a more modern direction, some traditional denominations, such as Presbyterian Church USA, are offering “new worship” communities, said Rev. Jon Moore of Laguna’s Presbyterian Church. “The communities are reaching people who have never gone to church or are turned off by church,” he said. The pop-up church groups are meeting in coffee shops, homes, community centers, RV parks, wherever people gather, said Moore, connecting with people who have common interests. “The church is recognizing that spirituality does not necessarily mean religion,” Moore said. While a majority of church-goers who fill pews are over 45, the majority of the people attracted to the pop-up approach are under 40. And there’s a greater racial mix, Moore said. An article in the July 22 edition about a new pastor at the Neighborhood Congregational Church incorrectly reported the circumstances of his predecessor’s departure. The Rev. B. J. Beu was terminated without cause with neither severance pay nor health insurance coverage, said his wife, Mary Scifres.